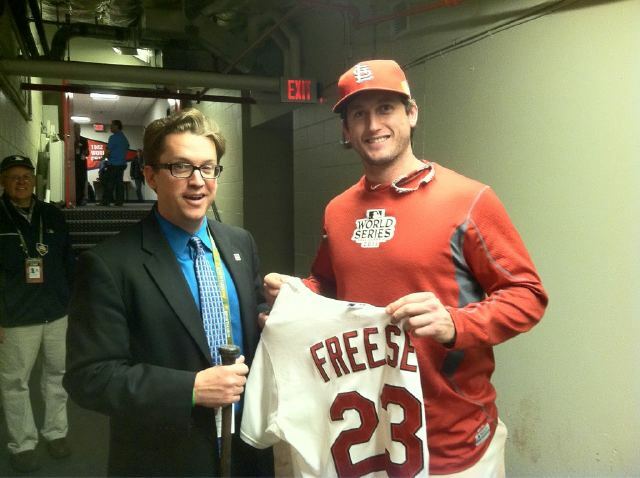 Brad Horn of the Hall of Fame accepts David Freese's donation of his Game 6 jersey. Baseball Hall of Fame President, Jeff Idelson, and Hall Communications Director, Brad Horn, spent the week at the World Series hoping to secure artifact donations from Cardinal and Ranger players and they ended up walking away with quite a haul. Both headed back to Cooperstown with the ultimate Series prize of David Freese’s shredded Cardinal jersey worn for his Game 6-winning home run. The Hall officials somehow tracked down pieces of the jersey that was torn by Freese’s teammates as he crossed home plate and, thanks to a generous donation by the Cardinal hero, its next destination is a display case in Cooperstown. But just as one artifact is added to the Hall’s impressive collection, another is apparently hitting the auction block in the Texas Rangers’ own backyard, at Heritage Auction Galleries in Dallas. Slated for sale in its November auction is yet another rare document that may have been stolen from the National Baseball Library as part of a massive theft in Cooperstown during the 1980s. 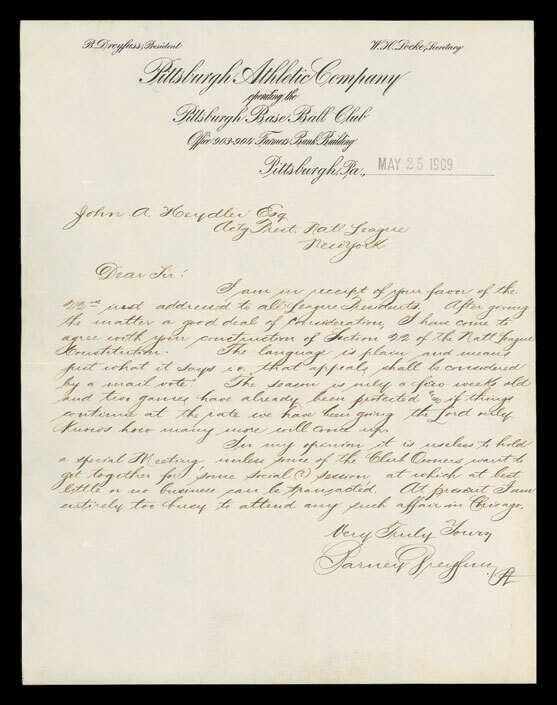 Lot 80923 is a 1924 letter addressed to National League president John Heydler from Pittsburgh Pirate owner and Hall of Famer Barney Dreyfus and related to a questionable call by umpires in a protested game. Dreyfus, who was forwarding the league the written statement of his manager, Bill McKechnie,wrote, “The failure of the two umpires to see where the ball went when the other 12,000 people in the park did is a disgrace.” Authentic letters written by the Hall of Famer are scarce and have commanded sale prices topping $10,000. Heritage currently has a bid on the letter for $1,912. The letter is strikingly similar to several documents that have been offered at auction by Heritage, the auction house that employs Antiques Roadshow appraiser Mike Gutierrez as a consignment director. Gutierrez was a prime suspect in a 1980s FBI investigation into thefts that occurred at the Hall of Fame. Over the past two years Heritage has offered and withdrawn similar letters written by Hall of Famers Charles Comiskey, Ban Johnson, Joe Tinker, Fred Clarke, Ed Barrow and Kenesaw Mountain Landis that are believed to have originated from the Hall of Fame’s famous August Herrmann Papers archive, perhaps the largest single holding of baseball correspondence and documents known to exist. The collection features the personal and business files of Reds owner August Herrmann who was also the head of Baseball’s ruling body, the National Commission, before the game had a Commissioner. The archive was discovered by Reds owner Powell Crosley Jr. in a storage room at Crosley Field and was donated to the Hall in 1960. 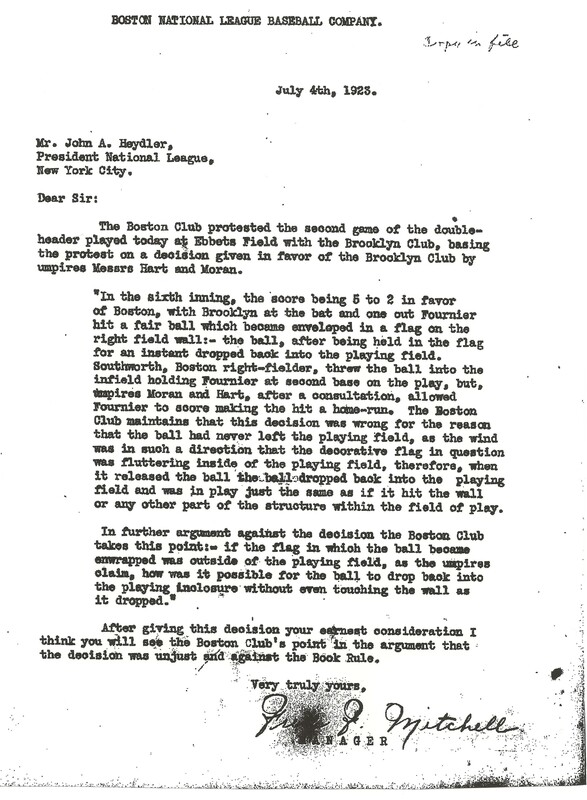 This protest letter written by HOFer Barney Dreyfus is believed to have been stolen from the National Baseball Library. The National Baseball Library was the final destination for Herrmann’s special case-files of documents related to protested games in the National League between 1902 to 1926. Each protested contest case was decided by the National Commission and featured correspondence and affidavits from players, managers, umpires and ownership related to each game. However, likely due to the thefts in the 1980s, many of the game files have incomplete records and others are missing. It is believed that many of the valuable documents from this collection have made their way into some of the nation’s top private collections. The Heritage auction features Dreyfus’ letter to John Heydler and references his enclosing the statement of his manager, Bill McKechnie. This 1925 statement from Pirate manager Bill McKechnie to NL President John Heydler still resides in the HOFs Herrmann Papers "Protested Games" files. 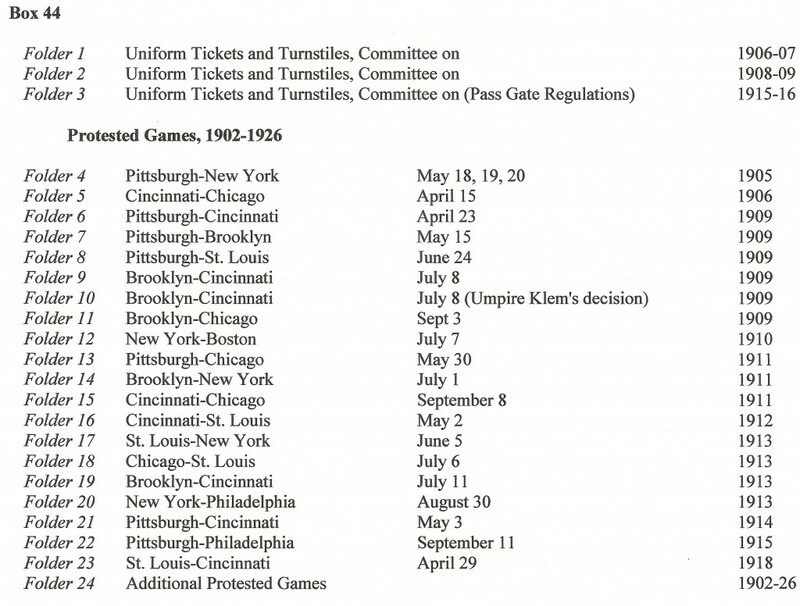 However, other letters written by Dreyfus to Heydler and statements from McKechnie regarding protested contests still reside in Cooperstown as part of the Herrmann archive and its “Protested Games” section. So why isn’t Heritage’s Dreyfus letter available for researchers at the Hall’s A. Bartlett Giamatti Research Center along with the others he wrote to League presidents between 1902 and 1926? These letters from Dreyfus to NL Presidents Heydler, Lynch and Tener are currently part of the HOFs Herrmann Papers archive at the NBL in Cooperstown. Those letters Dreyfus penned to NL Presidents Heydler, John Tener and T. J. Lynch are still found in the Herrmann Papers archive at Cooperstown and serve as evidence illustrating how the National Baseball Library was the target of a large-scale theft of historic documents. One such document that eluded thieves is another Dreyfus letter addressed to Heydler and is dated May 10, 1909. It is still part of Herrmann’s original treasure-trove. This letter was written to John Heydler by Barney Dreyfus just two weeks before the Mastro Dreyfus letter was also written to NL President John Heydler. This letter from May 10, 1909 is still found in the HOFs Herrmann Papers archive. Heritage’s current offering is not the first Dreyfus letter believed to have been stolen from the Hall of Fame or to appear at public auction. In 2008, another example, also addressed to NL President John Heydler, sold for $9,000 at Mastro Auctions. 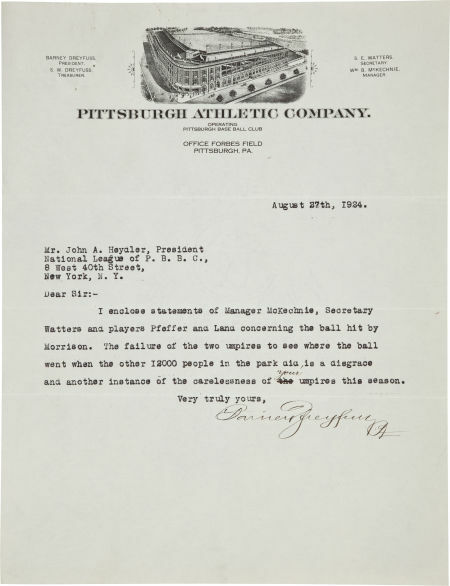 The letter is dated, May 25, 1909, just two weeks after the letter that is still part of the Hall of Fame’s collection. This 1909 letter written by Barney Dreyfus to NL President John Heydler sold for $9,000 in a 2008 Mastro auction. Protested game letters believed to originate from the Hall of Fame’s collection have also appeared at other auctions including Clean Sweep, SportsCards Plus, Robert Edward Auctions, Lelands, Hunt Auctions, Christies, Mike Gutierrez Auctions, Richard Wolfers, Superior and the 1999 Sotheby’s sale of the Barry Halper Collection. Many of the suspect documents trace back to the Halper Collection, which has been documented as including many items stolen from the Hall of Fame, the New York Public Library and the Boston Public Library. 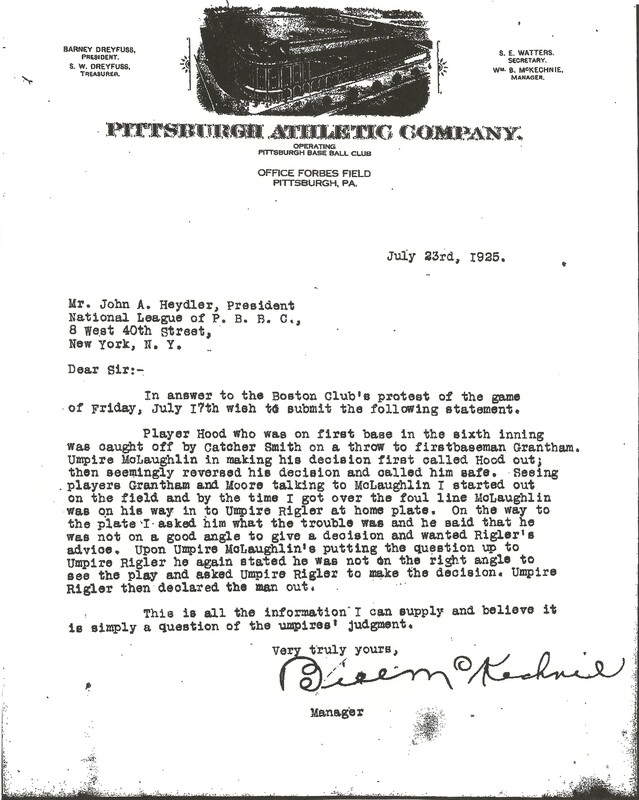 In particular, the 1999 Halper sale featured another protested game letter addressed to John Heydler in 1923 by Boston Braves President Christy Mathewson. This letter from Christy Mathewson to John Heydler in 1923 was regarding a protested game by the Boston Braves. The letter was sold by Barry Halper in 1999 at Sotheby's for $5,462. 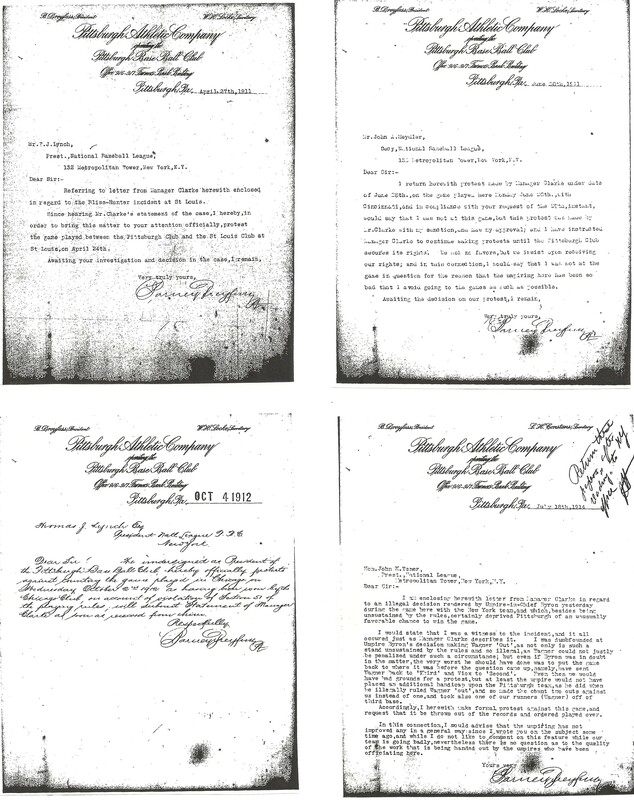 An examination of the Hall of Fame’s Herrmann archive shows that all of the valuable protest correspondence from Mathewson as the Reds manager and the Boston team president appears to have been removed from the files, while less valuable documents from utility players and officials remain in Cooperstown. This July 4, 1923 statement written by Braves manager Fred Mitchell is today found in the HOFs Herrmann archive at the NBL while a corresponding letter written by Braves president Christy Mathewson written on July 9, 1923 was sold by Barry Halper at Sotheby's in 1999. A source who requested anonymity, told us that Halper acquired several of his National League ”protested game letters” and other correspondence addressed to August Herrmann directly from Mike Gutierrez . Gutierrez also authenticated all of Halper’s “protest letters” and August Herrmann correspondence for the 1999 Halper sale as a Sotheby’s expert consultant for autographed materials. Gutierrez was a known supplier to Halper as evidenced in the 2010 SABR article, Stumped by the Storyteller, by Ron Cobb. Cobb revealed in his article, “Al Stump, (who) was actively trying to sell Cobb memorabilia, worked with Mike Gutierrez on selling the Cobb items that Stump supplied. Many of the items were sold to Barry Halper.” Cobb also revealed that the items Gutierrez sold Halper were forgeries executed by Stump, himself. Another collector, who also requested anonymity, revealed for us that he purchased other letters addressed to August Herrmann directly from Gutierrez. In addition, the first suspected Herrmann letters appeared at public auction in the early 1990s at Superior Galleries in Beverly Hills, California. At the time of those offerings Gutierrez was employed by Superior. Box 44 of the Herrmann papers archive houses the National League Protest correspondence maintained by August Herrmann as the Chairman of the National Commission. The files include ptotested contests from 1902 to 1926. The mystery surrounding the origins of the “protest letters” being offered for sale at auction has added to the Hall of Fame controversy. None of the auction houses have answers as to the provenance of their offered documents and the Hall of Fame has failed to explain why the documents are no longer in their collection. After receiving previous inquiries by Haulsofshame.com in the past two years Ivy, to his credit, has removed several letters suspected to have been stolen from the Hall of Fame. 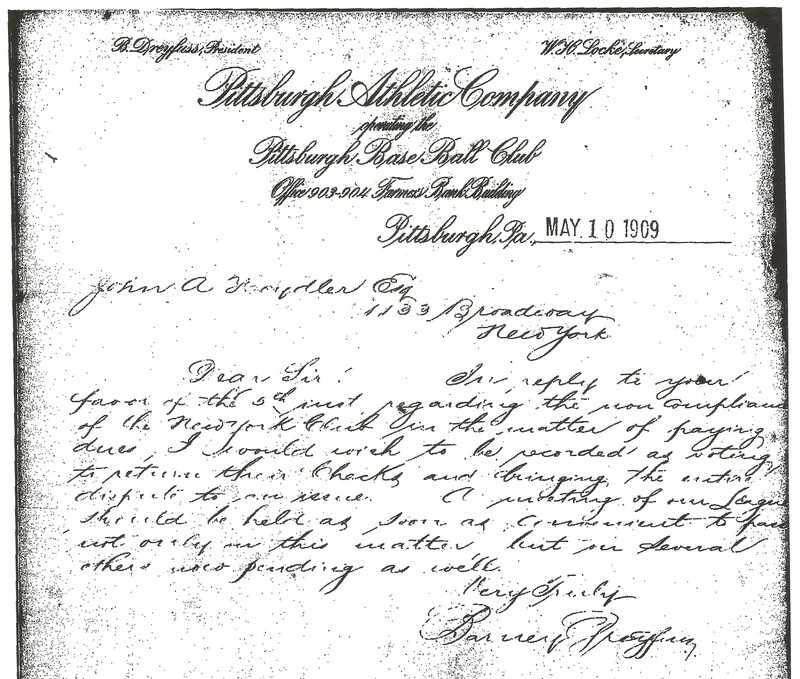 Some of those have been protest letters, one of which was another Pittsburgh Pirate statement issued by manager Fred Clarke. Ivy also had no answers for us as to what has happened to the lots removed from prior Heritage auctions and whether the Hall of Fame has attempted to recover those suspected Herrmann items withdrawn from sales. Likewise, Hall of Fame spokesperson Brad Horn and President Jeff Idelson did not respond to our inquiries about the Dreyfus “protest letter” or any of the prior items withdrawn from Heritage sales. When the last suspected Herrmann item surfaced for sale at Clean Sweep Auctions this past February, the Hall failed to pursue recovery of the document as Horn told Clean Sweep’s Steve Verkman, “There is insufficient information for us to unequivocally state that these were stolen from the Hall of Fame.” Sources indicate that Horn made that statement without the Hall having conducted their own investigation into the thefts. Evans was the first person to link current Heritage employee Mike Gutierrez to the sale of an item stolen from the National Baseball Library in 1988 when he purchased a Babe Ruth signed photo from Gutierrez featuring a Hall of Fame library accession number covered by white-out. According to an ex-Hall of Fame official, an investigation was then commenced by the FBI at the urging of head librarian Tom Heitz. Evans was interviewed by FBI agents who came to his NYC office and Gutierrez was investigated as a suspect because of his sale of the Ruth photo. The FBI also learned that Gutierrez had spent considerable time researching in the National Baseball Library during the mid-1980s. Mike Gutierrez is still the consignment director for Heritage Auction Galleries in Dallas, Texas. Heritage advertises "annual sales exceeding $500 million." A friend who accompanied Gutierrez on a trip to the Hall of Fame’s library told the FBI he was an eyewitness to actual thefts. Josh Evans says the eyewitness also told him that he saw Gutierrez “steal a Nap Lajoie letter from the (August) Herrmann archive.” Evans told us earlier this year, “He told me how he did it, he (Gutierrez) would take ten original letters, photocopying them, returning nine originals and putting one original and nine photocopies in his briefcase.” An ex-Hall of Fame official told us that Gutierrez was one of the only people to have unsupervised access to the Herrmann Papers archive in the 1980s. Twenty-three years later the current leadership at the Hall appears to be running and hiding as well, hoping that the memories of the 1980s heist will just fade away. But with each auction offering of the suspected stolen documents, that memory is kept alive by outfits like Heritage and others who continue to ignore the tell-tale signs of Hall of Fame ownership and the non-existent provenance furnished by their consignors. What the Hall of Fame appears to fear most is that the admission of its failure to safeguard donated artifacts in the past will negatively effect their ability to secure donations in the future. That the next World Series hero might think twice before handing over his championship treasures from the Fall Classic to Hall officials. Considering the Hall of Fame may have lost well over $1 million in donated materials under their custodianship, those fears are surely warranted. I couldn’t have said it better than Josh Evans. At least the HOF’s letters didn’t get shredded yet. Shredding? Now we’re talking. Let’s shred it all. It just goes to show you how stupid the HOF actually is and they want John Q Public to consisder them God and bow down to them and clammer inside there doors and spend money like it is water,when in reality the HOF is no better than Barry Halper, a big phoney. Calling the Hall of Fame “stupid” is a pretty harsh assessment. Many of the individuals who work at the Hall are actually wonderful, hard-working, community-minded, philanthropic people. The theft of so many precious documents does indeed reflect poorly on the security features, or lack thereof, in use at the Hall during the 1980s, but it doesn’t necessarily serve as an indictment of the apparent ambivalence currently on display by the Hall towards the loss of those artifacts. The Hall may be hamstrung by its dependence on financial support from individual donors rather than large entities such as MLB (which has no affiliation with the Hall at all); it costs a considerable amount of money to hire investigators and authenticators, and to conduct extensive and far-reaching inquiries into long-ago crimes. And as Peter Nash so tellingly points out, the officers of the Hall may not want to discourage potential donors from continuing the flow of artifacts into the museum and its archives by bringing up a theft that happened thirty years ago as some sort of bogus evidence of its lax security policies today. Allowing a theft to happen by virtue of a trust betrayed is a whole different ball of wax than expending the time, energy, and financial resources to get the stolen property back. There’s nothing stupid, arrogant, cowardly, or money-grubbing about the Hall’s attitude or conduct as far as I can discern, simply human nature at work. Will anyone here (or anywhere) step up to the plate and volunteer to do what it takes to restore the stolen documents to the Hall and hold those responsible for the thefts accountable to the law, not to mention to baseball purists and aficionados everywhere? I can’t imagine that the Hall would be anything but humbly grateful. Nor would I. Good points, but the Hall of Fame’s failure to pursue recovery is much more complicated. Firstly, it would cost them nothing to re-enlist the FBI as the NYPL has. Secondly, the HOF does not own their artifacts, New York State does, and they appear to be violating their responsibility to the state as a non profit educational institution in refusing to enlist law enforcemnet and pursue recovery. At least that’s what we’re told. The older museums also are adjusting. The National Baseball Hall of Fame last year began a comprehensive digitization project to make its vast collection of artifacts, documents, photos and videos accessible via computer, President Jeff Idelson said. Its museum in Cooperstown, while continuing to collect players’ artifacts from every major milestone in the game, has added much video and spruced up the displays. The video of Cal Ripken breaking Lou Gehrig’s consecutive games-played record is shown in a monitor inside Gehrig’s old Yankee Stadium locker. While the baseball hall’s IRS return reported losses in 2008 and ‘09, Idelson said that is an example of the accrual accounting methods. The Hall reported a $7.8 million profit in 2007, with contributions nearly $10 million more than other years. “We don’t get into the specifics of donations, but … we had a few pledges that hit the books that year that are then paid out slowly,” he said. But the economy has taken a little bite out of the Cooperstown hall’s attendance, on track for about 275,000 for this year. This will be the third consecutive year it’s below 300,000, a benchmark it had cleared for 12 years in a row. 1924 Barney Dreyfuss Signed Letter. The Hall of Fame owner of the Pittsburgh Pirates pulls no punches as he excoriates National League president John Heydler for an officiating error. He writes, in part, “The failure of the two umpires to see where the ball went when the other 12000 people in the park did is a disgrace and another instance of the carelessness of your umpires this season.” Dreyfuss’ closing black ballpoint signature is 9/10. Single sheet of beautiful team letterhead exhibits original mailing folds but no other issues of note. A top-level example of one of the tougher Hall of Fame signatures in the hobby. Pre-certified by PSA/DNA. Auction LOA from James Spence Authentication. Guide Value or Estimate: $2,000 – $4,000. Kudos to Heritage for doing the right thing and removing it from the sale. To Perry Barber- I am not saying that all the people are stupid, as you refer, I meant, the HOF in general for not pursuing the investigations into the stolen material,by having the proper investigative agencies get involved.John Q.Public has the right to know what has taken place within the confines of the hall.How would you feel, if you donated something to the hall and one day, they call you and inform you that it is missing,I know for one, I would be highly perturbed and first thing I would ask is, who did you report this to, FBI,STATE POLICE or who? Now,on another note, when was the last time you were in the hall and if you havent been in a while, why has the two main figure statues been removed from the main entrance and replaced by others ?? I am making reference to the FATHER Of Baseball,Babe Ruth and The Splendid Splinter, Ted Williams and I dont want to hear cause it was time for a change.This is the excuse that has been floating around and is in plain lamens terms,STUPID.Had it not been for Babe Ruth, there wouldnt be a HOF, cause there wouldnt of been any baseball.I rest my case, as to why I use the term STUPID.